Through our SEEDifferently™ initiative, we hope to inspire communities to grow their own food and see the untapped potential in all spaces. You can use tomatoes and cilantro grown at home to prepare this healthy fall meal! Serves 4 | Prep and cook time: 40 min. Add sweet potato and onion. Cook, stirring often until onion begins to soften; about 4 minutes. Add garlic, chili powder, cumin and salt. Stir constantly for 30 seconds. Add water and bring to a simmer. 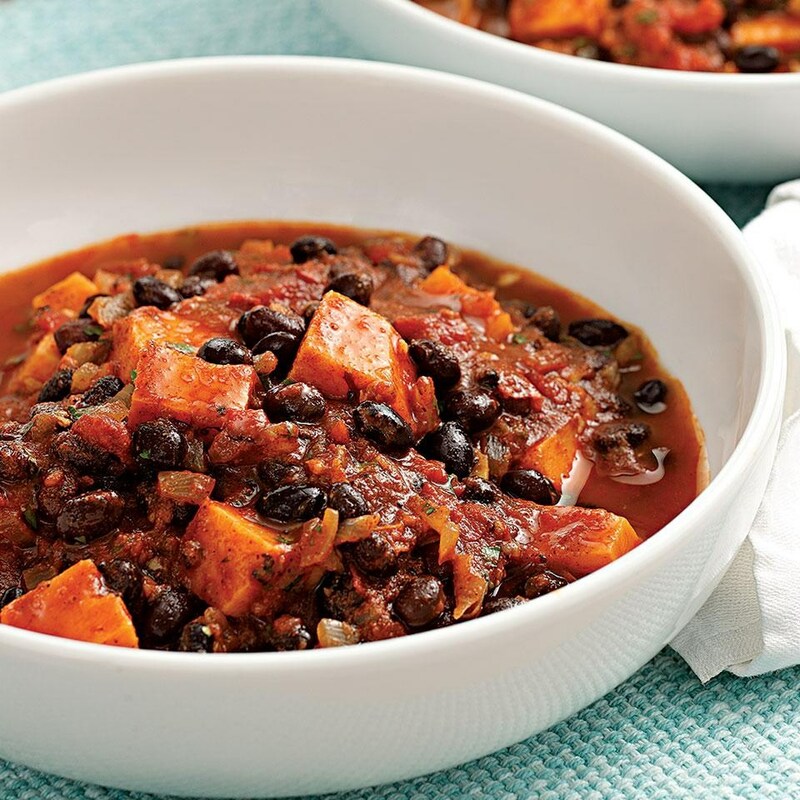 Cover, reduce heat to maintain a summer and cook until the sweet potato is tender; 10-12 minutes. Add beans, tomatoes and lime juice; increase to high heat and return to a simmer, stirring often. Reduce heat and simmer until slightly reduced; about 5 minutes. Tips: Cover and refrigerate up to 3 days; freeze for up to 3 months; Consider using tomatoes and cilantro grown at home to freshen up the meal. Learn more about growing your own food through the SEEDifferently™ initiative. Contact Sara Glenn by email at sglenn@firstcoastymca.org. JACKSONVILLE, Fla. – Community groups raised funds to provide free swim lessons to more than 250 local students at the new Winston Family YMCA. Water is everywhere in Jacksonville and it can be unsafe for children who don’t know how to swim. Of the 18 people who drowned in Jacksonville this year 5 were kids under 14. It is a generational problem where parents themselves can not swim and skills or new training is not passed on to their children. Not having access to lessons or financial restraints are barriers to acquiring water skills. The Y’s Safety Around Water curriculum teaches children how to swim to the surface and reach a pool edge. The goal is to teach children how to get out safely and respond to unexpected water situations. 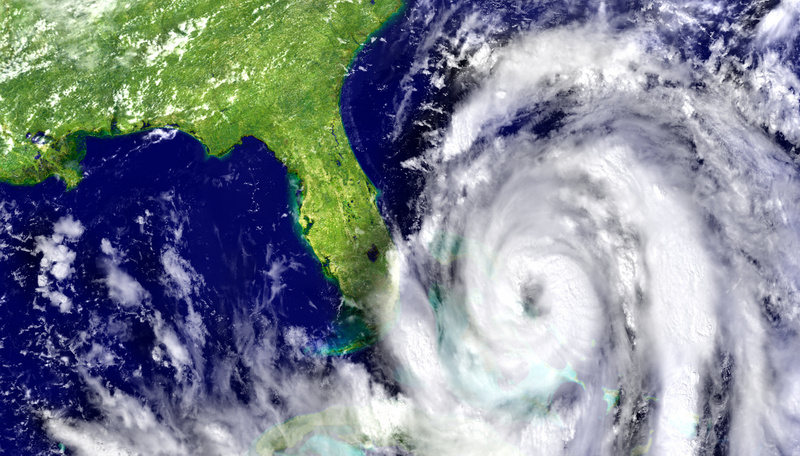 The United Way of Northeast Florida, St. Johns County United Way, The Community Foundation for Northeast Florida, and Jewish Federation of Jacksonville have joined forces to help those impacted by Hurricane Matthew and any future natural disasters in Northeast Florida. The Jessie Ball duPont Fund committed $250,000 to seed this effort and is matching donations up to another $250,000. Here’s How You Can Help: bit.ly/flfirstcoastrelief. The United Way of Northeast Florida has also partnered with the American Red Cross Northeast Florida Chapter and HandsOn Jacksonville to provide information on the most critical volunteer needs. Please visit HandsOn Jacksonville’s website for the most updated information. It’s important for your safety and those around you to engage in safe volunteer opportunities and never arrive on a scene without proper training by an official disaster response organization. 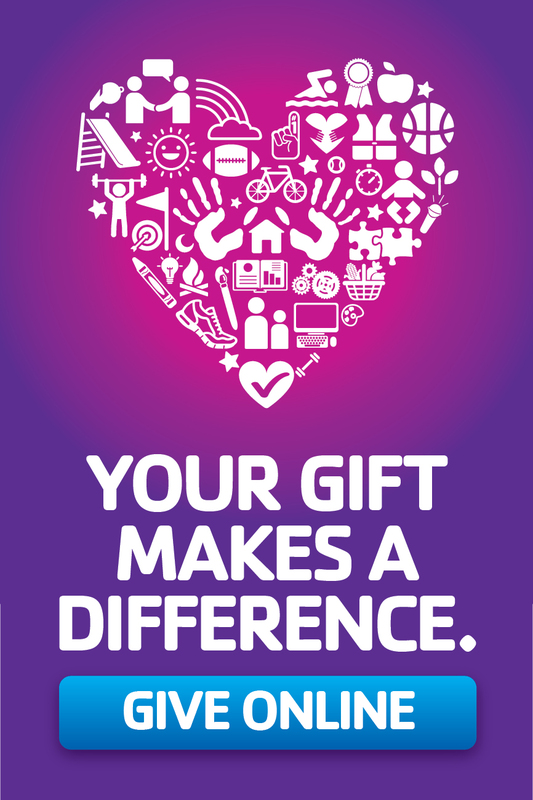 Please register your volunteer interest with local agencies. Please refrain from bringing donations such as clothing, food or supplies unless requested. All kids have potential. From one child’s point of view, see the true impact of our words. The Y nurtures the potential of every child and teen by supporting their unique youth development journey through holistic programming. From cradle to career, the Y provides all youth with the tools and resources they need to succeed in life. Click here to learn more about our Before and Afterschool Care and Early Learning programs. 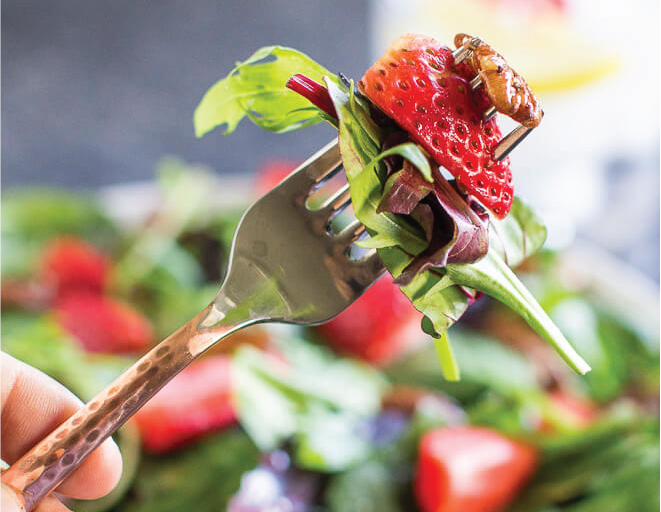 We know how difficult it can be to stick to eating healthy, but we want to make things a little easier by giving you this simple, easy-to-prepare recipe for Spinach Berry Salad. It’s a summertime favorite that can be enjoyed year round! Serves 4 | Prep time: 10 min. In a large salad bowl, toss together spinach, strawberries, blueberries, onion and pecans. In a jar with a tight-fitting lid, combine dressing ingredients. Shake well. Pour over salad and toss to coat. Serve immediately. 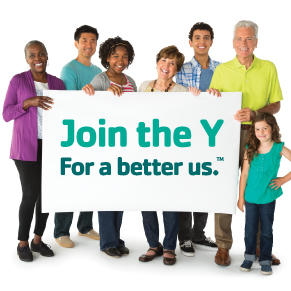 For more information on the SEEDifferently™ initiative, contact Sara Glenn by email at sglenn@firstcoastymca.org. 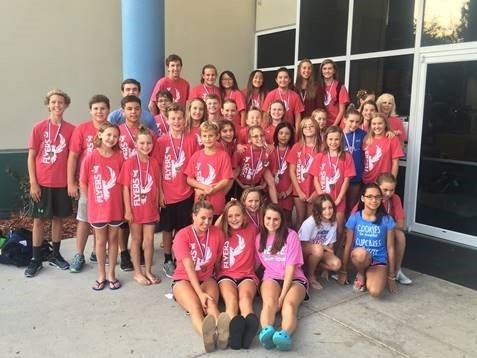 Members of the Ponte Vedra YMCA’s Flyers Swim Team recently gathered to celebrate a very successful 2015/2016 year with an award ceremony, and kicked off the new season with an Olympic-themed party. More than 40 swimmers enjoyed treats and fun with their teammates. The Flyers team has grown dramatically in the past two years under the coaching of Jennifer Salles-Cunha. So many swimmers wanted to join that an intermediate division was added in the Fall of 2015 under new coach Monique Salles-Cunha. The Coaches also welcomed several new swimmers to the team. With the presentation of the medals, the coaches took a moment to acknowledge their accomplishments as well as their potential for the new season. Jesse Hagy taking 10th place in the 100 yard Breast Stroke and 7th place in the 50 yard Breast Stroke with a time of 28.55 seconds. Jason Hepfer dominated his age group by placing in the top ten in six events, most notably winning first place in the 100 yard Butterfly with a time of 57.31. Jason also took 2nd in the 50 yard Butterfly, 3rd in the 100 yard Individual Medley, and 3rd in the 200 yard Freestyle. Reilly McCabe excelled in the 50 yard Freestyle and 50 yard Back Stroke, taking 7th and 8th places, respectively. Lilly McCabe was also in the top ten in the 100 yard Breast Stroke with a time of 1:09.59. The Sectionals event was attended by Jesse Hagy participating in three events and Lilly McCabe swimming in five. At the Summer Flags Event, Tristan Lewers did great in the Back Stroke, taking 9th place in the 100 yard and 7th place in the 50 yard, with a time of 38.35. Reilly McCabe shined by getting in the top ten in four events, most notably taking 2nd place in the 50 yard Free Style with a time of 28.23, the same event that she won when she was a ten-year-old. The new season started in September and the coaches and swimmers of the Flyers Swim Team are anticipating a fun and successful season for 2016/2017. 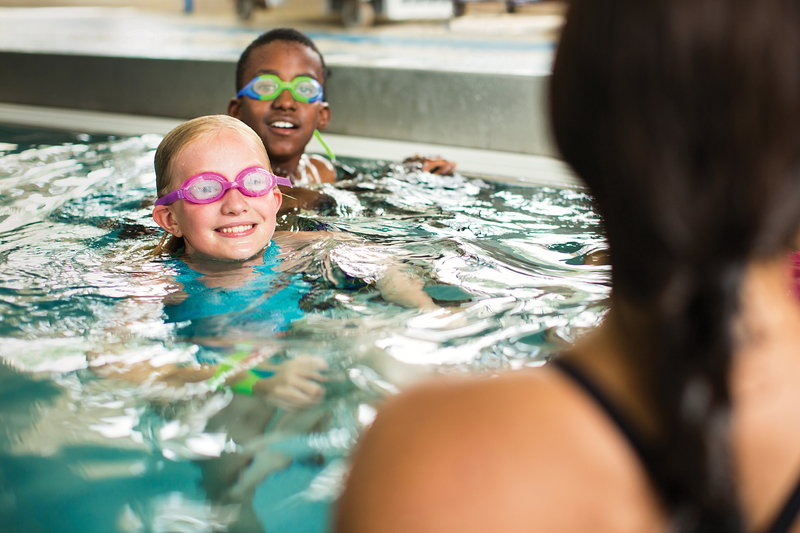 Click here to learn more about YMCA Aquatic Programs. 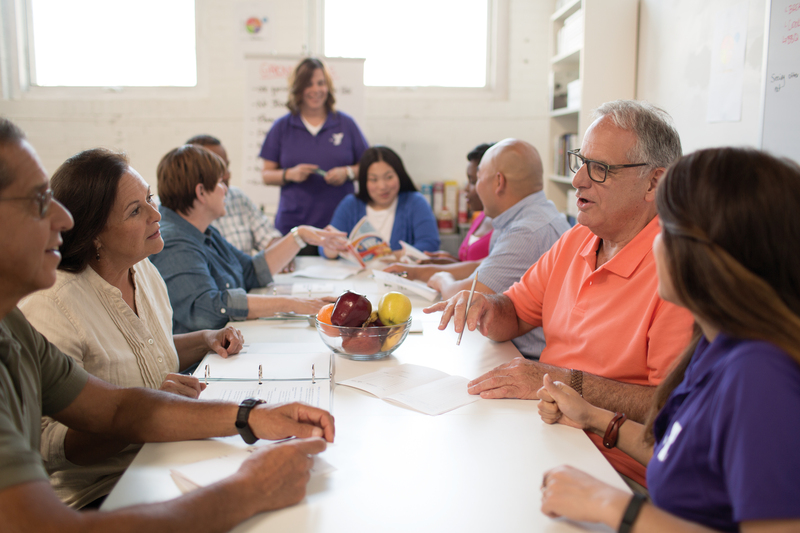 CVS Health today announced that it has partnered with the YMCA of theUSA (Y-USA) to help expand two programs that provide critical support to people across the country: the Diabetes Prevention Program and the nationally recognized LIVESTRONG® Foundation at the YMCA program. The YMCA’s Diabetes Prevention Program is a group-based lifestyle intervention for adults at high risk of developing type 2 diabetes. Through a 12-month evidence-based plan, the program has been successful in reducing the number of new cases of diabetes by 58 percent overall and by 71 percent in adults over 60. LIVESTRONG at the YMCA is a 12-week evidence-based program that focuses on best practices for physical activity and well-being initiatives for cancer survivors. The program empowers adult cancer survivors to improve functional capacity and to increase their quality of life through an organized program of fitness and strength offered in a supportive, small-group setting. For more information about the First Coast YMCA Diabetes Prevention Program, click here. The Wait for Winston is Over! James H. Winston, a Jacksonville civic leader, real estate developer and philanthropist, has been a YMCA devotee for 50 years. 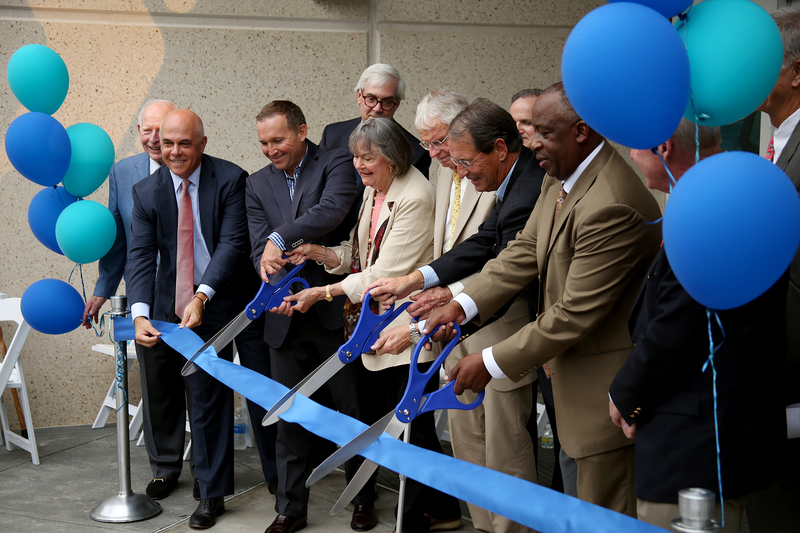 But Friday he helped cut the ribbon to open the YMCA of Florida’s First Coast’s new flagship branch bearing his family name, which offers far more than a gym and a pool. The $21 million, 72,000-square-foot Riverside showplace will have programming for youth development, healthy living and social responsibility and be a hub for the area Y’s efforts to reduce chronic illnesses such as cancer, stroke, heart disease and diabetes, in a partnership with Baptist Health, Brooks Rehabilitation and Florida Blue. Lets Move! Outside Engages Youth in Over 50 Cities! Through the Department of the Interior’s Partnership with the YMCA of the USA, American Express, local governments and hundreds of nonprofit organizations, Let’s Move! 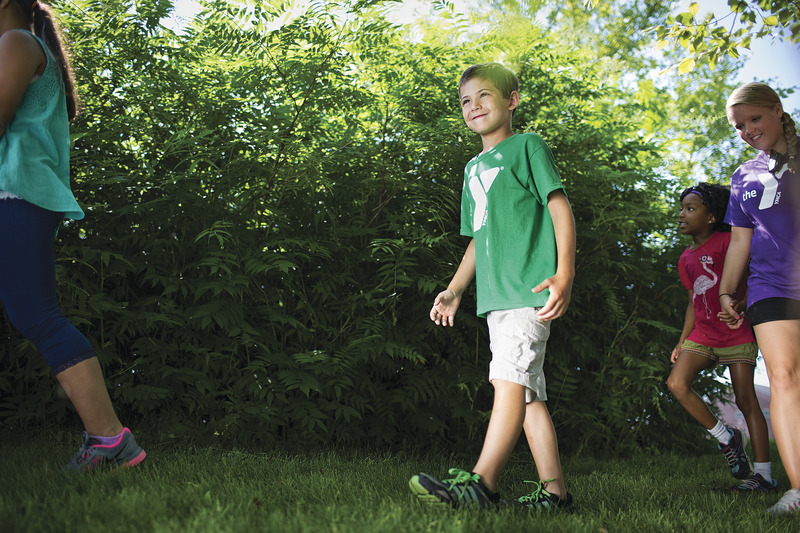 Outside is getting millions of kids to play, learn, serve and work outdoors. Through hard work, strong partners, leadership and vision, we have not only met our ambitious goals – we have exceeded many of them. Cheers rang out in the halls of Edward Waters College, as 700 YMCA campers from across the First Coast sat awaiting the start of Thingamajig. 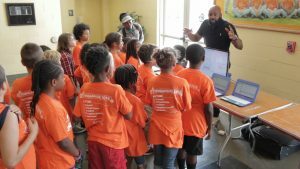 First Coast YMCA puts on the Thingamijig convention in hopes of educating youth aged 7-15 about STEM (science, technology, engineering, and mathematics) through a hands on approach. This year’s second annual Thingamajig was sponsored by Vystar and featured activity booths from Florida Public Archaeology Network, JEA, Mathnasium, Johnson Teens, VyStar, Claim It App, Baptist Health, Safe Kids Coalition, Wolfson Children’s Hospital, Chick fil A of Mandarin, Firehouse Subs, Sratchwerks, Enviroscapes by AmeriCorp, SeeDifferently, Edward Waters College, Florida IT Network, and UNF School of Computing, Engineering, and Robotics. Children spent the day in 16 hands on workshops, and they participated in challenges that allowed them to build marble roller coasters, create their own inventions and even launch off their own bottle rockets. Although a great opportunity for summer fun, these activities also help to open the doors to strategic thinking, creative expression and great careers. At the Y, young people have numerous opportunities to learn, play and be inspired through STEM. Thingamajig is just one example of how we’re opening children’s eyes to the wonders of science, and how we’ve worked to make a difference in the lives of the children of our community this summer. To view more photos of Thingamajig fun, click here.